Over the years, your dentist in Lewisville has been stressing the importance of diet and it’s connection to patients’ oral health. Yes, brushing and flossing daily is needed to remove food debris and plaque that collects throughout the day. It’s also essential to visit the dentist every six months. However, the foods you eat make a big difference on how quickly your teeth become damaged over time. To avoid dental erosion and inflammation, it’s important to keep note of these facts about diet in relation to oral health. Every time you eat or drink, sugars and starches are consumed by millions of oral bacteria. The bacteria releases acids after consuming these sugars, leaving your teeth and gums vulnerable for up to an hour. The more acidic your mouth is, the more prone you are to dental damage and disease. Therefore, it’s imperative that you take the proper steps to raise your mouth’s pH balance. One of the most common conditions patients experience due to an unhealthy diet is dental erosion. Keep in mind that dental erosion doesn’t only put your teeth at risk of decay and cavities. It can also cause your teeth to become discolored as your enamel wears down. This will lead to the naturally yellow dentin becoming exposed as well as tooth sensitivity. What Does a Mouth-Friendly Diet Look Like? Luckily, there are many ways to maintain a diet that promotes good oral health. According to your Lewisville dentist, eating three balanced meals daily is much better than snacking throughout the day. Contrary to popular belief, it isn’t the amount of sugar you consume that matters, but when and how often you consume it. Many foods that are good for teeth also contain sugar, but that doesn’t mean you can’t eat them. It just means eating them as part of a meal is recommended rather than several times throughout the day. Balanced meals do a better job at stimulating saliva production, which works to break down foods and wash away bacteria until your oral care routine. While brushing after meals is important, it can actually be harmful to brush immediately after a meal. This is because your enamel is likely still soft after being exposed to acids, so you’re better off just rinsing your mouth and waiting 30 minutes before brushing. Chewing sugarless gum for about 40 minutes also works to produce saliva. Look for the ADA’s Seal of Approval to confirm it has these properties. Good oral care isn’t only about brushing and flossing. It also means having a healthy diet. 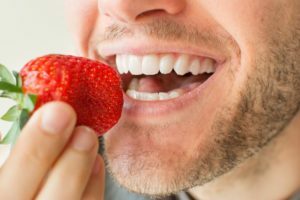 Schedule an appointment with your dentist in Lewisville today to learn more about having a mouth-friendly diet! Dr. Christopher Capehart earned his DDS degree from the University of Texas Health Science Center at San Antonio. He’s always continuing his education to help patients maintain healthy smiles and provide the most effective treatments possible. To learn more about his practice, contact him through his website.